The cover of volume I. The 15th Congress of the International Society of Folk Narrative Research (ISFNR), organized by the Hellenic Folklore Research Centre of the Academy of Athens, summoned in Athens (21-27 June 2009) many distinguished academics from many countries. The Congress was hailed as particularly successful by the delegates themselves during their stay in Athens but also by the broader academic community according to publications in prestigious academic journals (e.g. Fabula, Bulletin of ISFNR), some of which are reproduced with the permission of the publishers in the Proceedings (vol. III, pp. 665-682). 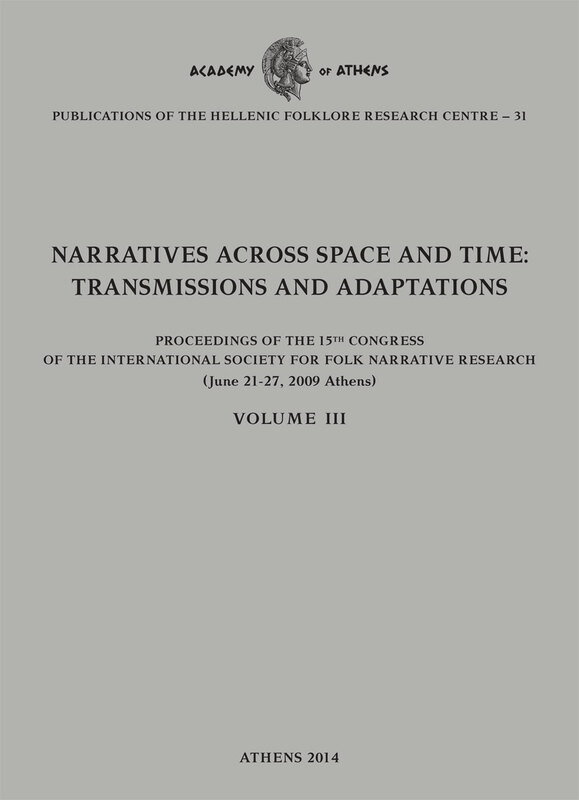 The inclusion of the proceedings in the Publications of the HFRC series, under the title, Narratives Across Space and Time: Transmissions and Adaptations, in three large volumes (numbering 2184 pages in total) presents the results of the works of the Congress, and contributes to the international narratοlogical research. The contributions included in the publication (numbering 129) are written in three languages, dominance being given to the English language, as also happened during the works of the Congress. In particular, 2 texts are published in Greek, 124 in English, and 3 in German. At the beginning of the first volume, there is an introductory text by the then Director of the Centre, dr. Aikaterini Polymerou-Kamilaki, Chairman of the Academic and Organizing Committee of the Congress and in charge of the publication; also the reception speeches by the then President of the Academy of Athens, professor emeritus Panos Ligomenidis, and the then President of ISFNR professor Ülo Valk. 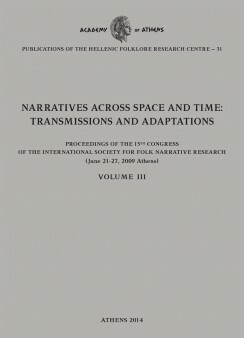 Three texts presented at plenary sessions of the Congress follow (by the academic supervisor of the HFRC, Stephanos D. Imellos, professor emeritus Michalis Meraklis and the independent researcher Vivian Labrie). The texts are presented in alphabetical order covering all the thematic areas of the Congress: History and Future of Folk Narrative Research, Mythologies, Ecology and Environmental Representations, Migrant and Diaspora Communities: Adaptation and Memory, Social Strategies and Collective Identities, Storytelling and Storytellers, Folk Narrative in the Modern Media, Folk Art Narratives and Representations. At the end of the 3rd volume of the publication included are the abstracts and the program of the Congress, a resolution for the safeguard of the intangible heritage and the return of the cultural goods – such as the Acropolis marbles – to their place of origin, and photographic material from the speeches and the rich parallel events. During the works of the Congress, and the two special Symposia held in its frame (i.e. one of the Special Committee on Charms, Charmers and Charming, and the Symposium on Belief Tales) particular emphasis was given on the fact that the narratological research systematically follows the modern social and cultural developments, and constitutes a dynamic branch of science of folkloristics worldwide. The presentation of the Proceedings during the year 2014 coincides with the fiftieth anniversary of the 4th Congress of ISFNR in Athens, in 1964, the proceedings of which were published under the editorship of the late president of the Hellenic Folklore Society, director of the Folklore Archive and academician, professor G. A. Megas. The Congress, which had remained in the memory of the academic community, in the expression of the ageless researcher Vilmos Voigt, was an important landmark for ISFNR and for the folklore and ethnological studies in general. Besides, in its margin, the Société Internationale d’Ethnologie et de Folklore (SIEF) was founded, as the successor of the Commission Internationale des Arts Populaires (CIAP), the fiftieth anniversary of which are being celebrated this year with a series of events in Europe. With the completion of the publication of the Proceedings of the 15th Congress of ISFNR, the HFRC makes an essential contribution to modern narratological research, and continues its academic tradition, which it has cultivated for almost a century, and also its cooperation with academic institutions and societies worldwide.